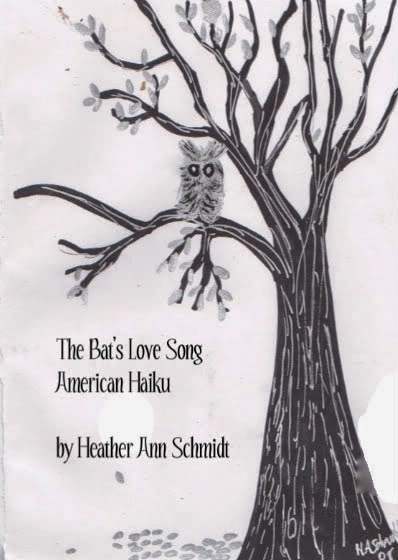 The Bat's Love Song: American Haiku by Heather Ann Schmidt was published by Crisis Chronicles Press on 1 December 2009. The Bat's Love Song: American Haiku consists of 43 poems on 16 pages. Injket printed on lavender paper and saddle staple bound using pale gray cover stock. Cover art also by Heather Ann Schmidt. Approximately 110 copies in print. Click here to see reviews of The Bat's Love Song at Goodreads. Click here to see a clip of Heather Ann Schmidt reading her poetry, including selections from The Bat's Love Song, during the Lix and Kix Poetry Extravaganza in Lakewood, Ohio. "Heather Ann Schmidt is an adjunct professor at Oakland Community College in Michigan. She edits tinfoildresses poetry journal. Her poems can be found in various online and print journals. Her other books include Channeling Isadora Duncan (Gold Wake Press, 2009), The Owl & the Muse: Collected Tanka (recycled karma press, 2009) and a full collection of poems forthcoming from Village Green Press. She received her MFA from National University." Crisis Chronicles subsequently published (or will publish) three more collections of Heather's poems: Transient Angels (2012), Red Hibiscus (2013) and Field Notes (forthcoming, 2014). On 19 October 2009, Crisis Chronicles Press was pleased to publish d.a. levy's Suburban Monastery Death Poem. This epic work originally appeared in print in the late 1960s. I transcribed the text for this new Crisis Chronicles version from the second zero edition, an Offense Fund reprint published in Cleveland in 1976 — a copy of which levy's friend rjs (who edited the zero edition) kindly sent me in early 2009. First, I made this long poem available in its entirety for free in the Crisis Chronicles cyber litmag, because the point of republishing it isn't to make money. It's a labor of love, an homage, a way to honor levy's legacy and further broadcast his finest work. Without d.a. levy, neither our Cleveland poetry scene nor our small poetry press community would be as rich (I don't mean financially) as they are. 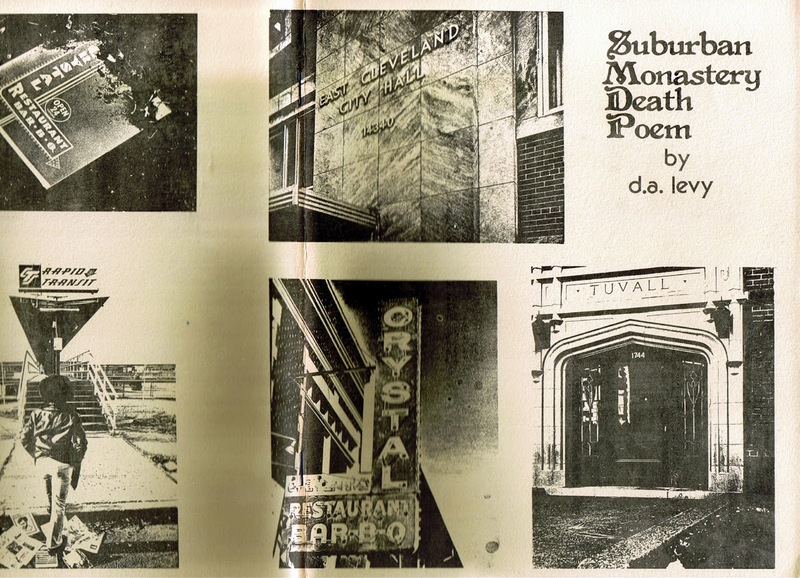 And levy's Suburban Monastery Death Poem is, in my humble opinion, one of the finest pieces of literature to come out of not only Cleveland, but also America. I feel richer for having read it — and I trust you will, too. If you want a copy of this masterwork, please send whatever you think it's worth to Crisis Chronicles Press; 3431 George Avenue, Parma, Ohio 44134 USA. You can also order securely through the PayPal button below. 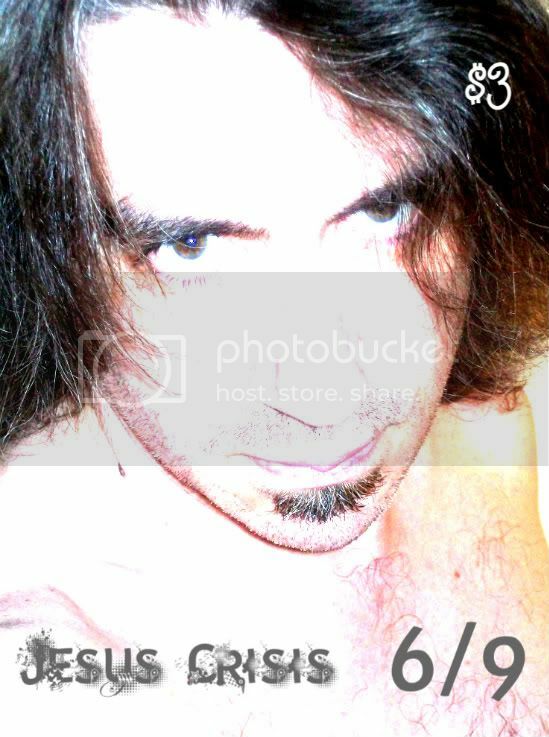 Or write to me at jc@crisischronicles.com and we can barter or make other arrangements. Originally published 19 October 2009. Saddle staple bound using ivory cardstock. Poems printed on ivory, cream and/or white paper. First CC Press edition inkjet printed. Later reprints laser printed. 8.5" x 5.5" Approximately 120 copies in print, 15 remaining. Muriel Rukeyser said that the universe is composed not of atoms, but of stories. Alex Gildzen sees this clearly and is, of all the living writers I've been privileged to know, one of the most adept at putting his life's universe(s) into poetry. I then had the opportunity to meet him at Tres Versing the Panda in May, where he read some of his Elyria poems. I was most impressed. A week or few later, when he offered me the opportunity to publish them, I was nearly giddy with excitement. Alex's first chapbook (Into the Sea by Abraxas Press of Madison, WI) was published in 1969. Dozens of other books have followed. His most recent, Beth (by Green Panda Press of Cleveland Heights), was released in early 2009. Now Crisis Chronicles Press is pleased to join in this 40th anniversary celebration by announcing our publication of his brand new poetry collection, Elyria: Point A in Ohio Triangle. This collection of poems is particularly meaningful to me because, like Alex, I was raised in Elyria, Ohio. Albeit in different generations,we grew up in the same neighborhood — even lived on the same street (Lexington Avenue, only three blocks from my current home) at points in our respective childhoods. In Elyria, Alex writes about Cascade Park, where as a young man I slept on picnic tables and wrote poetry on post glacial boulders; about Ely Park, where I waded in the fountain with friends while listening to Prince's Around the World in a Day and drinking Wild Irish Rose; about Black River, which runs behind my dad's old house; and about Kenyon Avenue, where my now-wife lived during the first few years I was in prison. Alex's poems aren't about my experiences with those places. They're about his own. But that makes them all the more evocative for me. Not only does 2009 mark 40 years since his first chapbook. It also marks 60 years since Alex's first ever published work — when a painting he made of his grade school at age six (now gracing the above cover) appeared in a 1949 Elyria City Schools publication called We Go To School. I invite you to join in this celebration of Alex's fine work, our unique city of Elyria, and these two very special anniversaries by getting your hands on a copy of Elyria: Point A in Ohio Triangle. The poems in it are perfect true story microcosms of a universe I've always enjoyed exploring. And I believe you'll enjoy the journey as well. Elyria: Point A in Ohio Triangle is 14 pages, 8.5" x 5.5", inkjet printed on alternating white and ivory paper, and saddle staple bound using beige card stock. Cover image is from a watercolor Alex Gildzen painted of his school as a child. Approximately 200 copies in print. In the summer of 2013, Crisis Chronicles Press published a newly revised and illustrated edition of Elyria exclusively via Kindle. Click here to get yours. And stay tuned. 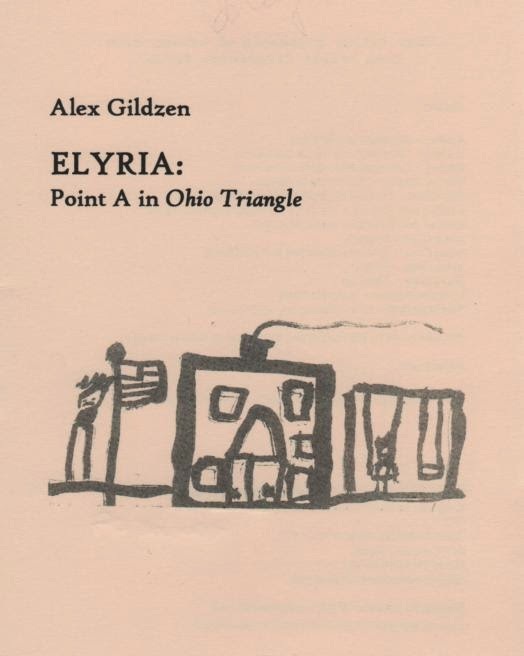 In April 2015, Crisis Chronicles published a 75-page perfect bound edition of Alex Gildzen's complete Ohio Triangle. Click here to see reviews of Elyria: Point A in Ohio Triangle at Goodreads. Click here to read reviews of Elyria at Amazon.com. Click here to read Steven Allen May's thoughts on Elyria at chap*books. Click here to see and hear Gildzen read "Ford in Cascade Park" from Elyria at YouTube. Alex Gildzen was born in California in 1943 but took the train to Ohio at two weeks. He grew up in Elyria — moving from Lexington to Warren to Winckles. He began school at Garford which he painted at age 6. He attended Kent State, where he was drama critic for the student paper and began the little magazine Toucan with R.L. Carothers. Later he taught English at Kent and became curator of special collections, cataloguing the papers of James Broughton and Jean-Claude van Italie, and the archives of the Open Theater. There he co-edited the bibliographic journal The Serif, with Dean Keller. He also edited the library's Occasional Papers which published poetry by John Ashberry and Gary Snyder, prose by Richard Grossinger and Anais Nin, and art by Alex Katz and Robert Smithson. He took an early retirement so he could move to Santa Fe to write full time. While serving on the board of the local AIDS organization, he produced the first pop concert in the history of Santa Fe opera. One of Gildzen's works in progress is Ohio Triangle. The other points in the collection are Cleveland and Kent.